Okay, we did not get real close to the Bald Eagles, but I had to post this image. Outside of a zoo, I had never seen a Bald Eagle in the wild. 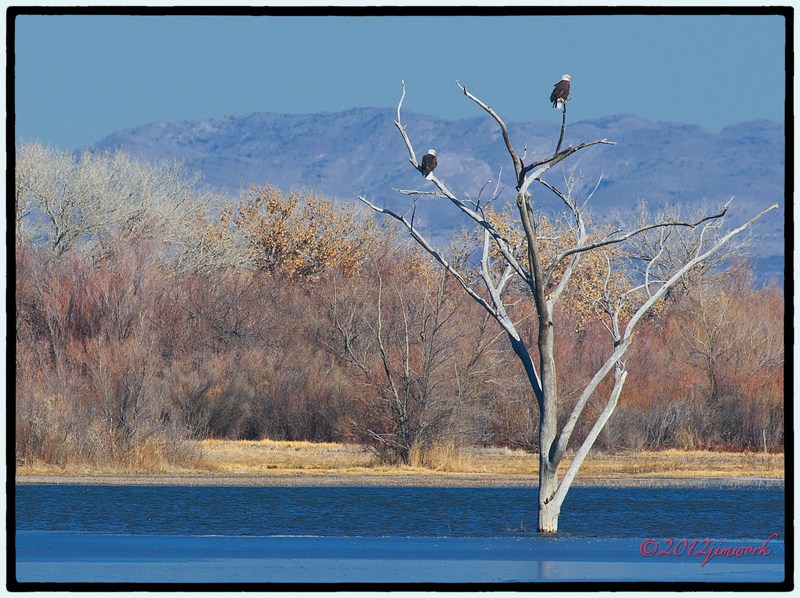 After the first day and not having caught sight of even 1 of the 5 that were listed as being at Bosque Del Apache, NM, I had prayed for seeing an eagle. Within five minutes of arriving at the refuge the next morning, bam, there they were. A good couple of football fields away yet they did make the heart soar at the sight of them. Great shot. Love the dead tree in the water. Well done. Very nice! Great subject Jim, and I like the way you composed this shot.